Spain began their quest to win a fourth major international a tournament in a row with quite possibly the most emphatic 2-1 victory you will ever witness. They have now played 26 competitive games without defeat since their shock defeat to Switzerland in their opening game of the 2010 World Cup. Sections of the Spanish media are proclaiming the first half performance as their best yet under the guidance of del Bosque. And yes, whilst Spain were very good, the poverty of the display by the Uruguayans must form part of the equation. Spain dominated this game in its entirety from start to finish with first half goals from Pedro, via a hefty deflection off Lugano, and Soldado really failing to capture the supremacy of La Roja. A late free kick from Suarez placed a rather favorable slant on the scoreline for Uruguay but this was really yet another night when Andres Iniesta stood head and shoulders above anyone else on the pitch. From such a one-sided game, there were three interesting features worth further exploration; the Spanish set up, Uruguay’s ineffectiveness and the substitutions that occurred. With no Xabi Alonso due to injury, del Bosque named what was otherwise, arguably his strongest line up right now. The absence of Alonso forced del Bosque into a change with the removal of the doble pivote that has served Spain so well in major competitions. Busquets was now positioned alone at the base of midfield. 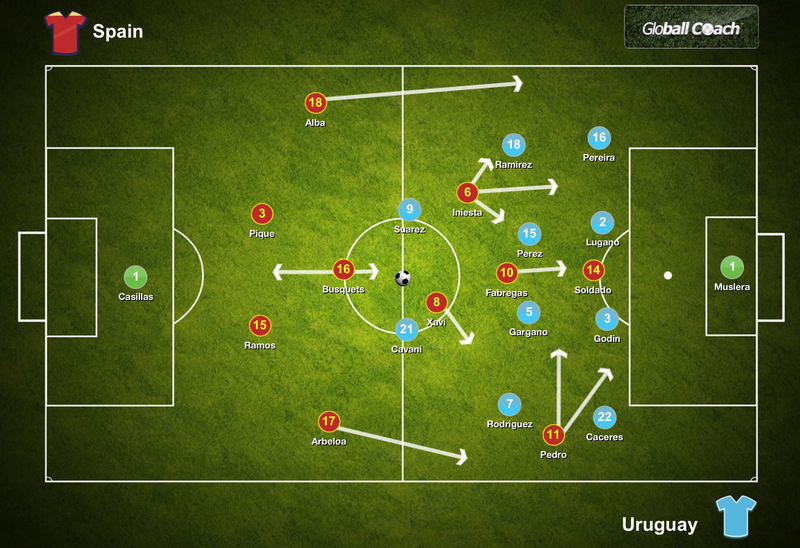 For Tabarez, his side lined up in a 4-4-2. Cavani supported Suzrez with Forlan on the bench. On paper, the Spanish were playing their obligatory 4-3-3 formation but in reality the system was far more fluid than that and also, far more asymmetrical. The system fluctuated from a 4-4-2 with a diamond in midfield to a 3-4-3 with Arbeloa and Alba operating as wing backs. The defensive unit took care of itself with Alba always happier to push forward more often and higher than Arbeloa on the right. With no Alonso, there was the possibility of Busquets getting isolated by Uruguay. To compensate for this, both Xavi and Iniesta played closer together. Iniesta played far more centrally than he normally does for Spain vacating the left wing berth and allowing Alba to move up and down here. The benefit of playing Iniesta in his natural position close to the centre enables him to share the burden of creativity with Xavi. Spain become harder to stop with two outlets. Fabregas completed the diamond in midfield and operated behind Soldado as the most advanced midfielder and his movement caused problems for a very linear opponent to deal with. Soldado remained the central reference point in attack with Pedro on the right but the winger was swift to move infield and link with team mates whilst providing space for Arbeloa to overlap. There remain questions over the suitability of Arbeloa. Too conservative going forward, opponents can provide him with space given his limited contribution in the final third but this reluctance to advance provides greater balance defensively. 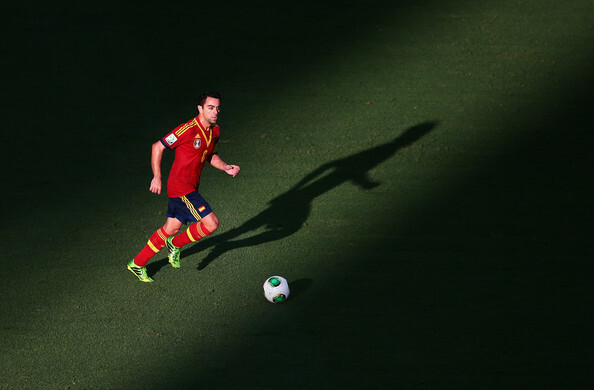 Could Spain really afford to have two full backs who attack relentlessly? The inability to add to their lead must play on del Bosque’s mind however. This game should have been finished by half time instead the late strike by Suarez led to a few brief nervous moments. Since their performances at the 2010 World Cup followed by the claiming of a record 15th Copa America title, it’s been something of a downward spiral for Uruguay. They find themselves mired in the middle of the pack in the current South American qualifying campaign for Brazil next year. An aging side has continued to grow old with slow gradual evolution favoured in place of the quicker, more disruptive revolution. The reason possibly being that there is nobody ready to step forward and benefit from such a revolution. The Olympic campaign was vastly underwhelming and has not identified the prospects to replace the old guard. Tabarez remains faithful to the bulk of the players who delivered the success but the momentum of the Copa triumph is waning. The recent 1-0 win over Venezuela in qualification halted a run of six qualifying games without a win which included four defeats. Taking that into consideration, Uruguay may have been expected to enter last night’s encounter buoyed by the recent success. Instead what we witnessed was a strange, at times baffling, display from a side who appeared to be following a template to combat Spain that was identified around 3 years ago. 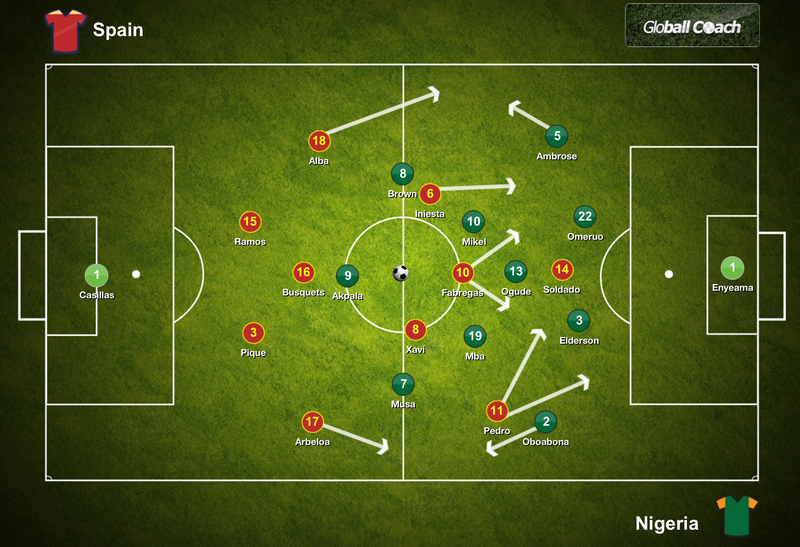 An approach which Spain have identified and resolved. Uruguay initially sat off Spain with pressure being applied at the halfway line but this strategy quickly gave way to la celeste dropping off even further and simply employing a low block using a 4-4-2 with Cavani and Suarez left up front. The side failed to retain possession though, badly panicking when recovering the ball and being placed under pressure by Spain. This led to the situation of being camped deep within their own half, unable to escape. When Uruguay did break forward, the plan seemed to be for Suarez and Cavani to run into space in the channels, pulling the Spanish pairing of Ramos and Pique wide but it never materialised. Nor did any attempt to expose Busquets operating alone. There was no intensity to Uruguay’s play, no hunger or desire. It was as if the players did not want to be there. The low block still failed to adequately deal with the movement of Fabregas who found space between the lines to provide the assist for Soldado. Quite frankly Uruguay looked disorgansied at times which can be rarely said of a Tabarez side. The use of Gaston Ramirez, bursting forward to support Suarez from a central position clearly failed in the first half with the Spanish swarming over their opponents centrally. He was replaced at half time by Gonzalez. Around the middle of the second half, Tabarez made two substitutions within a short space of time which were very surprising given how the game had played out until this point. The coach opted to withdraw both his central defensive midfielders in Gargano and Perez to be replaced by the Lodeiro, to operate as a deep lying playmaker, and Forlan. This created the possibility of being cut open by Spain but with the tempo dropping considerably, no further damage was inflicted by La Roja although it was noticeable that with the game stretched and open, Spain don’t enjoy the same level of control. With 13 minutes remaining, Javi Martinez replaced Xavi. The options for del Bosque was to return to the doble pivote and see the game out at 2-0 or continue with one defensive midfield and push one of the players into a higher role than they would normally enjoy at club level. There has been conjecture over the possibility of Busquets operating higher, demonstrating his first time vertical passing to open up opponents defences. In this event, Busquets remained in position and Martinez went further up field. Perhaps indicating that del Bosque values the defensive contribution of the Barcelona player above all else. Two years ago this game would have been considered a serious fight between two heavyweights at the top of their profession. Since then, Spain have maintained their level whilst Uruguay have dropped off. The gap in quality between the two is now more pronounced. What promised much had the feeling of a glorified pre-season friendly as it wore on. Was Uruguay more concerned about retaining their strength for the game against Nigeria? Had they already conceded defeat before they even went on the pitch? Their meek surrender certainly lends weight to this line of thought. Tabarez has admitted the game against Nigeria is of greater consequence to his side stating that it is “the most important of all” but even allowing for that, the manner of the capitulation last night must hurt. 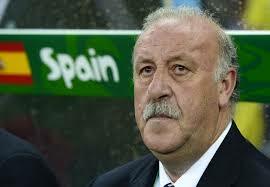 Del Bosque conceded that the Spanish grew tired as the game progressed with the high levels of humidity. And if you consider gaps, how do you measure that which exists between Spain and the minnows of Tahiti? Del Bosque is expected to make wholesale changes for a game in which double figures for Spain seems inevitable. The ability to rest players against Tahiti and possibly again against Nigeria as qualification will have been assured must be very appealing to the coach. It ensures all the squad can participate in the tournament giving fringe players some valuable game time while the key players rest. It’s just one game and it’s only the start of the tournament but the question already has to be asked of who can stop Spain. It simply looks like business as usual.